Cork, 16 May 2017: A new consortium called The Bridge Network was launched today at University College Cork. 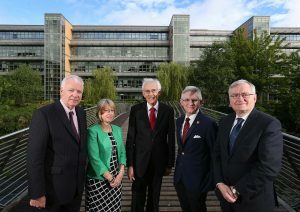 Led by UCC, the consortium comprises 4 technology transfer offices from University College Cork, Teagasc, Cork Institute of Technology and Institute of Technology Tralee and represents the largest consortium with a combined research revenue of €145 million. Building on significant success to date in terms of licensing, spin out companies and research income, the technology transfer consortium will create an effective link for knowledge transfer expertise to be shared and used in the member institutions, enhancing the innovation ecosystem regionally and nationally. Funded by Enterprise Ireland and supported by Knowledge Transfer Ireland, the Bridge Network consortium will apply its combined expertise to support the commercialisation of research, early stage spinout companies, licensing and ultimately effective relationships with industry. Over the last 2 years, UCC has had the largest industry-funded research income of universities in Ireland, with CIT similarly leading the Institutes of Technology in terms of income from industry sources. Together with Teagasc and IT Tralee, the consortium will create a model of national and international excellent practice. “We in CIT are very pleased to be part of this consortium. CIT has a strong tradition of working with all of the partners and we expect to enjoy enormous gains from the partnership. Given our long history of engagement with industry and supporting startups we also expect to be a significant contributor to the consortium and its impact,” said Dr. Brendan Murphy, CIT President. “Teagasc has a long history of impactful research across all facets of agriculture and food research from primary production to high value functional foods. As part of Teagasc’s commitment to deepening and extending this impact, membership of the Bridge Network under the leadership of UCC affords a platform to exchange best practice and attain maximal efficiency and client satisfaction in the transfer of new research and technology into the hands of the producers and companies. Furthermore it has greatly increased our researchers appreciation of maximising such impact thereby stimulating a greater level of meaningful engagements with Teagassc and the Irish agri-food sector”. Director of Knowledge Transfer Ireland, Dr. Alison Campbell OBE addressed the launch event, describing how the Bridge Network collaboration will drive and develop Ireland’s knowledge transfer system, supporting innovators and entrepreneurs and ultimately creating jobs for the economy. “The Bridge Network TT Consortium enables IT Tralee to work closely with our consortium partners to ensure a consistent approach to academic-industry technology transfer activities is provided across the South and South West regions. IT Tralee is committed to translating the outputs of its research and innovation activities into commercialised products that will stimulate new job creation. Leveraging the expertise of the Bridge Network TT consortium, our industry partners can be certain that they will continue to avail of the highest standards of knowledge transfer practices in their collaborations with IT Tralee” said Dr. Oliver Murphy, President of IT Tralee. The Bridge Network will also create a programme, that supports engagement between spinout companies and venture capitalists and angel investors, institutional investors and national agencies. Bringing together experienced tech enterpreneurs to act as mentors to early stage companies will also feature in the activities of the consortium. With a combined research funding value of €130 million, the Bridge Network Consortium brings together key players in the Irish ecosystem to collaborate effectively on the commercialisation of research agenda.